A number of large iguanas occur in various parts of the Americas. Perhaps the most curious of these large species is the Marine Iguana, which reaches a total length of 5 feet and, at one time, occurred in enormous numbers on the rocky shores of the volcanic Galapagos Islands. Several local races occurred, varying in—among other things —the amount of brick-red blotching the sides of the body. 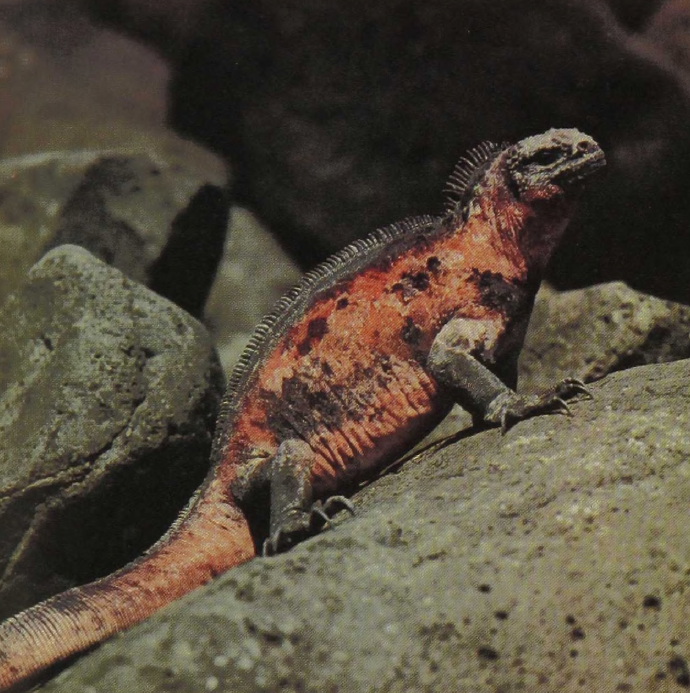 The Marine Iguana is primarily vegetarian, feeding on marine algae both when these are exposed at low tide and by grazing underwater. The animals swim very well, folding the arms against the body, which moves by slow undulation. The salt taken in as part of their diet is discharged from the blood by special glands on the side of the face.